Once again, Breyer Animal Creations has announced that NARHA is a BreyerFest Beneficiary for 2011. BreyerFest is an annual three-day model horse collector's festival and horse fair held at the Kentucky Horse Park. This year, the event, BreyerFest Fairy Tails, will run July 15-17. Every year, specific beneficiaries are selected as recipients of donations raised through BreyerFest activities, including raffles and auctions. Click here for information on Breyer Animal Creations and BreyerFest Fairy Tails. We thank Breyer Animal Creations, and its parent company Reeves International, for its continued support of NARHA. Each year the NARHA National Conference and Annual Meeting provides the equine-assisted activities and therapies industry the most valuable and comprehensive education opportunities available. A broad spectrum of session content is needed to offer a rich and invigorating experience for all attendees. 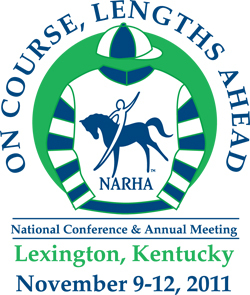 The 2011 NARHA National Conference is November 9-12 in Lexington, KY. At this time NARHA is conducting a call for papers. Come present at the 2011 National Conference and share how you, your organization or your research can help improve the equine-assisted activities and therapies field. Abstracts must be submitted to NARHA by April 5, 2011. No submissions will be accepted after April 5. In order to offer NARHA Region 7 conference attendees a better option of scheduled workshops and presentations, the Region 7 conference has been moved from May 13-15 to July 29-31, 2011, to be held still at the William H. Darr Agricultural and Equestrian Center at Missouri State University in Springfield, MO. Keep checking the Region 7 page on the NARHA website for registration and scheduling details as we look forward to this exciting conference in Springfield. The on-site workshop and certification co-sponsored by Region 7 and Therapeutic Riding of the Ozarks, scheduled for May 13-15, has not changed and will be held at the Darr Center in Springfield, MO. Sign up soon! Click here for information. NARHA continues to work diligently to obtain funding sources to ensure the maximum opportunity to underwrite scholarships for NARHA's National Conference and Annual Meeting. As leaders in the industry we are committed to providing our members with opportunities for continuing education and professional development. We are excited to offer these opportunities to experience the NARHA National Conference to those new as well as experienced in the field. This year we are happy to announce a new scholarship to be awarded annually, the Marjorie V. Kittredge Equine Facilitated Psychotherapy and Learning (EFP/L) Scholarship to be awarded to a person who is an EFP/L professional or studying to become one. The 2011 NARHA National Conference and Annual Meeting Scholarship application and the 2011 Marjorie V. Kittredge Equine Facilitated Psychotherapy and Learning Scholarship application are due by email, fax or posted no later than June 28, 2011. Click here to download applications. NARHA has just made it even easier to keep up with what's going on with your member organization. You can now follow NARHA on twitter. Sign up to follow NARHA's tweets at www.twitter.com/narha_org and receive the most up-to-date information about NARHA. Renew your center membership by March 15, 2011, and be entered to win one of three $200 gift certificate from Dover Saddlery. You can get a good blanket to finish out the winter or any other product they offer. Your center will also be entered in a drawing for other prizes, including one of five $75 Equestrian Collections gift certificates or a NARHA dry erase emergency contact board. All centers that have renewed by March 15th are eligible for the drawing. If you need assistance with the process, please let us know. If your renewal paperwork is "in the mail," thank you very much for recognizing the value of the benefits your center derives from your association membership such as NARHA brand recognition, access to the Foundation Directory online and your center listing on the NARHA website! Individual and center members are extended a 90-day grace period following the current membership date to renew their membership. A member who completes the membership renewal process during this time maintains the original membership join date and remains eligible for longevity programs and other tenure-based benefits. After the 90-day grace period a member can rejoin the organization and receives a new join date. The grace period is the amount of time after a membership expires and before a payment is made. During this time the member continues to receive benefits. When the grace period expires, if the member has not renewed, the membership is changed to inactive status. Centers that Renew by March 31st will maintain their original membership date. Your center's NARHA membership enables us to continue to expand the benefits we offer to our centers as NARHA members, promote the efficacy and legitimacy of equine-assisted activities and therapies and strengthen the miraculous work taking place daily at NARHA centers like yours. NARHA policies and procedures are in place to ensure consistent handling of all applicants. Effective November 1, 2009, any candidate without an Instructor in Training (IT) letter reflecting that he/she has met all of the Phase I requirements 32 days prior to the certification he/she intends to attend will not be rushed through the office process in order for the candidate to attend. The office recommends that any candidate applying for certification familiarize themselves thoroughly with the Phase I certification requirements and send in their application to the office in plenty of time to complete the components in order to attend their on-site certification. Also, effective November 1, 2010, if any candidate chooses to test without an IT letter or is allowed to test and the IT letter is not in hand, the candidate must be aware of the following processing fee that will be assessed by the NARHA office prior to their certification being final. 1. If the candidate does not have an IT letter by the time the candidate presents him/herself for certification testing and the evaluator allows the candidate to test, because they have reviewed the paperwork and feel the candidate has completed the required materials and can move forward with testing, the candidate will be invoiced an additional processing fee of $150 to be paid to the NARHA office prior to his/her certification results being released. Ultimately it is every candidate's responsibility to ensure all requirements have been met by the appropriate deadlines and that his/her IT letter is in hand in order to test for certification. NARHA offers professional certifications and candidates testing should be accountable for managing the professional credentials supporting their career goals. All candidates who have signed up to test for certification are emailed by the NARHA office approximately 30 days prior to their testing with an update on their Phase 1 status. If the candidate is missing an item and does not have an IT letter in hand, he/she is notified. Please note your workshop is good for two years from the time you took it, even if you took the workshop prior to 2010. Your 25 hours of practice instructor teaching are also good for two years. Please email Tara McChesney or call (800) 369-RIDE (7433) with questions regarding the 2011 on-site instructor workshop and certification process. Thank you! There are currently no Vaulting Workshops scheduled for 2011. Please check the NARHA Events Calendar for updates.